In the years following World War One, the U.S.Air Service designed a number of its own airplanes and then asked the aircraft industry to bid on building them. The Messenger was designed in 1920 at McCook Field, to provide the Army with a light message carrier to replace motorcycles in serving that function and to do the job far more quickly. Powered by a novel three-cylinder 64hp Lawrance engine, built on Long Island, the Messenger was designed as a practical single-place airplane intended to be able to fly out of small unprepared fields and from country roads. The Lawrence Sperry Aircraft Company of Farmingdale won the contract and ultimately built 42 Messengers. Lawrence Sperry, son of inventor Elmer Sperry, founded his own aviation company on Long Island in 1917. 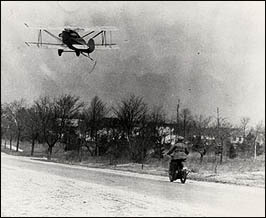 Sperry lived in Garden City and he kept the prototype Messenger for himself, using the road in front of his house as a runway. 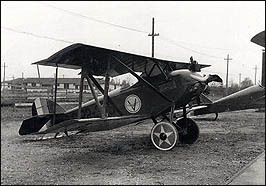 Sperry used this plane as a demonstrator and at one point landed it on the plaza in front of the Capitol in Washington. In 1922, over Mitchel Field, Lawrance Sperry, using a Messenger, made the first experiments aimed at testing the feasibility of hooking on to an airship in flight, and in 1923 he entered one in the St.Louis Air Races placing fourth. The Messenger was constructed entirely of wood, with the wings and tail fabric covered. In December 1923, Lawrence Sperry, in a Messenger, made a forced landing in the English Channel and apparently drowned while trying to swim ashore. This aircraft is a full-scale exact replica built by museum volunteers from original plans. Complete with an original engine based on the Lawrance, the aircraft is capable of being flown.